**I had the pleasure of seeing this on Day 2 of the San Diego Film Festival. I used to love watching foreign films and it has been a while since I seen one, so this one was quite a treat. Check it out and let me know what you think! In 2001: A Space Odyssey, Stanley Kubrick gave audiences a film like no other, one that breeches the idea that human beings are not alone and in the infinite vastness of the universe, anything is possible. Alonso Cuaron most recently gave us Gravity, a beautiful film that shows majestic nature of the galaxy and space travel, mixed with the harsh realities of being an astronaut. The French-Canadian film, Project-M, gives audiences something that feels like a combination of the two movies I just mentioned, mixed with the feel that we are watching a documentary or newsreel of the incidents that occur in space. Project-M is directed and co-written by Eric Piccoli, which features four astronauts who are chosen to lead a unique space mission; it encompasses living on board the space station for three years while doing research. Only the best and the brightest are chosen and it is felt that whoever can withstand three years in space and come out successful, will most likely have a bright future ahead of them. The mission has been funded by Quebec in hopes that they will find fresh water on Europa, one of Jupiter’s moons. The President announces it to the world and everyone is excited about this new venture into space. 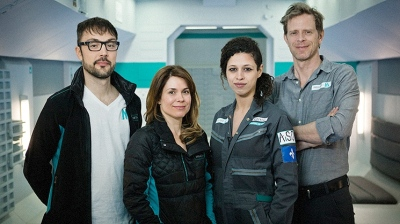 The four chosen astronauts are Vincent Kohler (Jean-Nicolas Verreault), he will command the mission and has notoriety as the second person to stand on Mars, Dr. Andrea Sakedaris (Julie Perreault) who is both the doctor on board and second in command, engineer Justine Roberval (Nadia Essadiqi) and the scientist Jonathan Laforest (Julien Deschamps Jolin). Throughout the film, we get both the viewpoints from each astronaut in space, along with news footage and interviews of people who are on Earth and also part of the mission. Each one talking about their role in the process and how they all know each other and have worked hard together to put this mission into place. 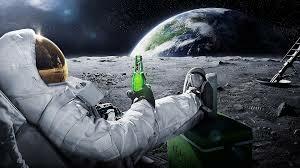 On board the space station, there are moments of revelry as when one of the crew sneaks in a bottle of champagne, they get a little drunk and let loose. We also start to find out who each person is and what kind of life they left behind, which are depicted with flashbacks of their life on Earth. On the mission, their lives seem so separated and far removed from what they used to be, they left behind relationships, both broken and good with family members and significant others and they left the pleasures of life to forge new territories in space. 900 days into the mission, suddenly the screens on board the station start to stream live footage of Earth being pummeled with bombs. From their viewpoint, Earth is lighting up like a Christmas tree all over the world. Their connections are being lost and they have no insight into what is going on and if the people they love are still alive. From here the entire movie feels almost like a reality show, we are watching how they react to this problem, both mentally and physically how it takes its toll on them. There are a limited number of supplies on board and how the astronauts choose to handle situations is enlightening. The movie feels fresh in a sea of films that always seem to reiterate the same ideas and perspectives. 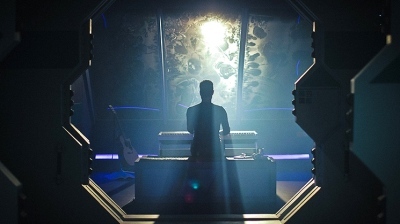 Throughout the film, the scientist Jonathan plays his piano on board the station; the classical music gives the film an almost haunting feeling. Being up in space can feel perilous and daunting and the music chosen works perfectly to produce those feelings. A lot of the shots make Earth look far away, distant, like a world that they have not ever encompassed or know anything about since they are so far removed from it now. I like that it was shown in that way and the special effects worked well and didn’t feel cheesy or fake. 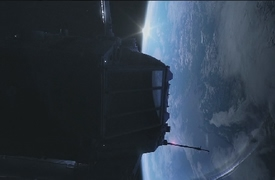 The space station looked beautiful and the lighting that was chosen for different parts of the station made sense in conveying the nature of where they were and their feelings. The control station was darker with muted undertones, considering they had the reflection of dark space outside of the window, in other areas like the medical room and in some hallways; it was bright and stark and showed the sterility and orderliness of being in an enclosed vessel. Not only is this film a look at being an astronaut and scientist in space, it is also a postcard for humanity. How do humans react to one another when they know their lives are on the line? How do they feel when they realize that they are not alone in the world and they are only a speck of oxygen in the vastness of the world? And are they alone in space? These questions are posed and we see the scientists try to answer them and come to terms with themselves and their lives. Not having ever seen any of the actors before, helped me in not having any preconceived notions about them. I think they all did great in the film and I would love to see more of them in American films, so they could be shown to a larger audience. One of my faves had to be Jolin, he was able to present emotion on a deep level and convey that without being too heavy handed. By the way he also co-wrote the film, so bravo to him for being able to pull both feats off. I wouldn’t say this movie is absolutely perfect, in no way shape or form, but it is unique and that is one of the reasons I enjoyed watching it. At points, it has lulls in the pacing and it felt a bit slow, but I think those moments can be overlooked. I would love to see this movie again and maybe even dig deeper into what I saw. This one may be harder to come by, but if you get the chance and can find it I would suggest watching it. Especially if you like sci-fi and anything related to space travel, then I think you would enjoy it. What do you guys think of the premise of this film? Does it interest you and would you want to go to space for 3 years?! This one sounds good to me, RP! #RP I actually think you would like it too! SHOCKER! Oooh this sounds like something I’d enjoy! Even with some slow parts, if the story is engaging I can usually tune in. Even the indie Europa Report was good though the ending was a bit disappointing. 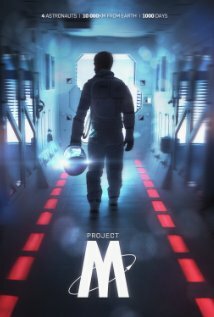 Reading that this is a combination of Gravity and 2001 makes me want to see this, but I really hate the name Project M. It makes me think it’s a prequel to that one party movie Project X.
lol I think you may enjoy this film too! And when I looked for pics I kept getting Project X pics coming up. So you are right about that…. the name is kinda lame. This could be fun for you, I could see you possibly enjoying it. Eric maybe would watch it too. We need a checkbox for that one! Wow this one sounds really cool! I remember thinking this one looked interesting when you posted about it before. Glad to know it lives up! I shall have to give it a watch when it’s available to the rest of us. 🙂 Excellent job! Yes agreed if you like sci-fi you would like it. It’s definitely interesting and different. You know what is funny I came on today thinking I need to catch up on Cara’s blog and low and behold I see comments from you. We’re on the same page! Sounds pretty trippy! Great work lady!